Seattle is the most populous city in the U.S state of Washington and the Northwestern United States. The encompassing Seattle-Tacoma-Bellevue metropolitan statistical area is the 15th largest in the United States, and the largest in the Pacific Northwest. Seattle is part of the 13th largest combined statistical area (CSA) in the US. A coastal city and major seaport, it is located in the western part of the state between Puget Sound, an arm of the Pacific Ocean, and Lake Washington, about 96 miles (154 km) south of the Canada - United States border. A major economic, cultural and educational center in the region, Seattle is the county seat of King County. By 2007 Census estimate, the city has a municipal population of 594,210, making it the twenty-fourth largest city by population in the US, and a metropolitan area population of 3,263,497. The Seattle area has been inhabited for at least 4,000 years, but European settlement began only in the mid-19th century. The first permanent white settlers-Arthur A. Denny and those subsequently known as the Denny Party-arrived November 13, 1851. Early settlements in the area were called 'New York-Alki' ('Alki' meaning 'by and by' in the local Chinook Jargon) and 'Duwamps'. In 1853, Doc Maynard suggested that the main settlement be renamed 'Seattle', an anglicized rendition of the name of Sealth, the chief of the two local tribes. From 1869 until 1982, Seattle was known as the 'Queen City'. Seattle's current official nickname is the 'Emerald City', the result of a contest held in the early 1980s; the reference is to the lush evergreen trees in the surrounding area. Seattle is also referred to informally as the 'Gateway to Alaska', 'Rain City', and 'Jet City', the latter from the local influence of Boeing. Seattle residents are known as Seattleites. Seattle is the birthplace of grunge music including bands: Alice in Chains, Pearl Jam, Soundgarden and Nirvana. Seattle has a reputation for heavy coffee consumption; coffee companies founded or based in Seattle include Starbucks, Seattle's Best Coffee, and Tully's. There are also many successful independent artisanal espresso roasters and cafes. Researchers at Central Connecticut State University ranked Seattle the most literate city of America's sixty-nine largest cities in 2005 and 2006, second most literate in 2007 (after Minneapolis), and tied with Minneapolis in 2008. Moreover, analysis of 2003 survey data by the United States Census Bureau indicated that Seattle was the most educated large city in the U.S.; 51.6 percent of residents aged 25 and older had bachelor's degrees. In terms of per capita income, a study by the U.S. Bureau of Economic Analysis ranked the Seattle metropolitan area 17th out of 363 metropolitan areas in 2006. Seattle is located between an inlet of the Pacific Ocean to the west called Puget Sound and Lake Washington to the east. The city's chief harbor, Elliott Bay, is an inlet of the Sound. West beyond the Sound are the Kitsap Peninsula and Olympic Mountains on the Olympic Peninsula; east beyond Lake Washington and the eastside suburbs are Lake Sammamish and the Cascade Range. Lake Washington's waters flow out through the Lake Washington Ship canal, a series of two man-made canals and Lake Union, to the Hiram C. Chittenden Locks at Salmon Bay, to Shilshole Bay, which is part of Puget Sound. The sea, rivers, forests, lakes, and fields were once rich enough to support one of the world's few sedentary hunter-gatherer societies. Opportunities for sailing, skiing, bicycling, camping, and hiking are nearby and accessible almost year-round. The city itself is hilly, though not uniformly so. Like Rome, the city is said to lie on seven hills; the lists vary, but typically include Capitol Hill, First Hill, West Seattle, Beacon Hill, Queen Anne, Magnolia, and the former Denny Hill. The Wallingford and Mount Baker neighborhoods are technically located on hills as well. Many of the hilliest areas are near the city center, with Capitol Hill, First Hill, and Beacon Hill collectively constituting something of a ridge along an isthmus between Elliott Bay and Lake Washington. The break in the ridge between First Hill and Beacon Hill is man-made, the result of two of the many regrading projects that reshaped the topography of the city center. The topography of the city center was also changed by the construction of a seawall and the artificial Harbor Island (completed 1909) at the mouth of the city's industrial Duwamish Waterway. Seattle is in an earthquake zone. A small earthquake, measuring 4.5 on the richter scale, awakened many residents on January 30, 2009 but did no damage. On February 28, 2001, the magnitude 6.8 Nisqually Earthquake, did significant architectural damage, especially in the Pioneer Square area (built on reclaimed land, as are the Industrial District and part of the city center), but caused no fatalities. Other strong quakes occurred on December 14, 1872 (estimated at 7.3 or 7.4 magnitude), April 13, 1949 (7.1), and April 29, 1965 (6.5). The 1949 quake caused eight known deaths, all in Seattle; the 1965 quake caused three deaths in Seattle directly, and one more by heart failure. Although the Seattle Fault passes just south of the city center, neither it nor the Cascadia subduction zone has caused an earthquake since the city's founding. The Cascadia subduction zone poses the threat of an earthquake of magnitude 9.0 or greater, capable of seriously damaging the city and collapsing many buildings, especially in zones built on fill. Seattle's mild climate is usually classified as Marine west coast (Cfb). However, its wet-winter/dry-summer pattern shows some characteristics of a Mediterranean climate (Csb), and it is sometimes classified this way. Temperature extremes are moderated by adjacent Puget Sound, the greater Pacific Ocean, and Lake Washington. The region is partially protected from Pacific storms by the Olympic Mountains and from Arctic air by the Cascade Range. Despite being on the margin of the rain shadow of the Olympic Mountains, the city has a reputation for frequent rain. This reputation derives from this frequency of precipitation as well as the fact that it is cloudy an average of 226 days per year (cf. 132 in New York City). Nonetheless, the city receives less annual precipitation, at 37.1 inches (94 cm), than New York City, Atlanta, Houston, and most cities of the Eastern Seaboard of the United States. Seattle was also not listed in a study that revealed the 10 rainiest cities in the continental United States. Most of the precipitation falls as drizzle or light rain, with only occasional downpours. One of these downpours occurred in December 2007 when widespread rainfall hit the greater Puget Sound area. It became the second wettest event in Seattle history when a little over 5 inches of rain fell on Seattle in a 24 hour period. The rain also caused five deaths and widespread flooding and damage. Spring, late fall, and winter are filled with days when it does not rain but looks as if it might because of cloudy, overcast skies. Winters are cool and wet with average lows around 35-40 °F (2-4 °C) on winter nights. Colder weather can occur, but seldom lasts more than a few days. Summers are dry and warm, with average daytime highs around 73-80 °F (22.2-26.7 °C). Hotter weather usually occurs only during a few summer days. Seattle's hottest official recorded temperature was 100 °F (37.8 °C) on July 20, 1994; the coldest recorded temperature was 0 °F (-18 °C) on January 31, 1950. Eighty miles (130 km) to the west, the Hoh Rain Forest in Olympic National Park on the western flank of the Olympic Mountains receives an annual average rainfall of 142 inches (361 cm), and the state capital, Olympia-south of the rain shadow-receives an annual average rainfall of 52 inches (132 cm). Snowfall is very infrequent, especially at lower altitudes and near the coast, and is usually light and fleeting, lasting only a few days. Heavier snowfall happens infrequently; a recent example happened from December 12-25, 2008, when over one foot of snow fell and stuck on much of the city's roads, causing pandemonium in a city so unaccustomed to heavy snow. Average annual snowfall, as measured at Sea-Tac Airport, is 13 inches (33 cm). Seattle's daily record snowfall was 20 inches (51 cm) on January 13, 1950. A sunnier and drier climate typically dominates from mid-July to mid-September. An average of 0.8 inches (2.0 cm) of rain falls in July and 1.0 inch (2.5 cm) in August. Although the summer climate is considerably drier and less humid than in areas with humid continental climates, a slight dampness can be occasionally felt, usually when temperatures reach above 80 °F (26.7 °C). This dampness is typically more noticeable during the evening when the temperatures have dropped. Because of this, Seattle experiences occasional summer thunderstorms. The Puget Sound Convergence Zone is an important feature of Seattle's weather. In the convergence zone, air arriving from the north meets air flowing in from the south. Both streams of air originate over the Pacific Ocean; airflow is split by the Olympic Mountains to Seattle's west, then reunited by the Cascade Mountains to the east. When the air currents meet, they are forced upward, resulting in convection. Thunderstorms caused by this activity can occur north and south of town, but Seattle itself rarely receives worse weather than occasional thunder and ice-pellet showers. Nonetheless, the Hanukkah Eve Wind Storm in December 2006 brought heavy rain and winds gusting up to 69 mph (111 km/h). One Seattleite drowned in her collapsed and flooded basement; power failures were widespread, with some left without power for up to eleven days. An exception to Seattle's dampness often occurs in El Nino years, when the marine weather systems track as far south as California and little precipitation falls in the Puget Sound area. Since the region's water comes from mountain snowpacks during the drier summer months, El Nino winters can not only produce substandard skiing but can result in water rationing and a shortage of hydroelectric power the following summer. Archaeological excavations confirm that the Seattle area has been inhabited by humans for at least 4,000 years. By the time the first European settlers arrived in the area, the Dkhw'Duw'Absh and Xachua'Bsh people (now called the Duwamish Tribe) occupied at least seventeen villages in the areas around Elliott Bay. A party led by Luther Collins, and a large number of other persons, filed legal claim to land at the mouth of the Duwamish River on September 14, 1851. Thirteen days later, members of the Collins Party on the way to their claim passed three scouts of the Denny Party, the group who would eventually found Seattle. Members of the Denny Party claimed land on Alki Point on September 28, 1851. 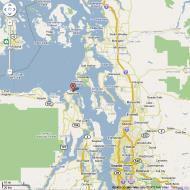 The rest of the Denny Party set sail from Portland, Oregon and landed on Alki during a rainstorm on November 13, 1851. After a difficult winter, most of the Denny Party relocated across Elliott Bay and founded the village of 'Dewamps' or 'Duwamps' on the site of present day Pioneer Square. Charles Terry and John Low remained at the original landing location and established a village they initially called 'New York', but renamed 'Alki' in April 1853, from a Chinook word meaning, roughly, by and by or someday. New York-Alki and Duwamps competed for dominance for the next few years, but in time Alki was abandoned and its residents moved across the bay to join the rest of the settlers. David Swinson ('Doc') Maynard, one of Duwamps's founders, was the primary advocate to rename the village 'Seattle' after Chief Sealth (si'ab Si'ahl) of the Duwamish and Suquamish tribes. When the first plats for village were filed on May 23, 1853, it was for the Town of Seattle. In 1855, nominal legal land settlements were established and the city was incorporated in 1865 and again in 1869, after having existed as an unincorporated town from 1867 to 1869. Seattle has a history of boom and bust cycles, common to cities near large areas of natural and mineral resources. Seattle has risen several times as a company town or through economic specialization, then gone into precipitous decline, but it has typically used those periods to successfully rebuild infrastructure. Like much of the American West, Seattle saw numerous conflicts between labor and management, as well as ethnic tensions that culminated in the anti-Chinese riots of 1885-1886. Seattle's economic success in this area was so great that when the Great Seattle Fire of 1889 destroyed the central business district, a far grander city center rapidly emerged in its place. Finance company Washington Mutual, for example, was founded in the immediate wake of the fire. However, the Panic of 1893 hit Seattle hard. Image showing 5th Avenue entrance of the Central Branch of the Seattle Public Library, designed by OMA; located on 4th and Madison street in Downtown Seattle. Columbia Center can also be seen in the background. The second and most dramatic boom was the direct result of the Klondike Gold Rush, which ended (for Seattle) the national depression that had begun with the Panic of 1893 and made Seattle a major transportation center. On July 14, 1897, the S.S. Portland docked with its famed 'ton of gold', and Seattle became the main transport and supply point for those heading north. The boom lasted well into the early part of the 20th century and funded many new Seattle companies and products. In 1907, 19-year-old James E. Casey borrowed $100 from a friend and founded the American Messenger Company (later UPS). Other Seattle companies founded during this period include Nordstrom and Eddie Bauer. The Gold Rush era culminated with the Alaska-Yukon-Pacific Exposition of 1909, which is largely responsible for the layout of today's University of Washington campus. A shipbuilding boom in the early part of the 20th century became massive during World War I; the subsequent retrenchment led to the Seattle General Strike of 1919, the first general strike in the country A 1912 city development plan by Virgil Bogue went largely unused. Seattle was mildly prosperous in the 1920s but was particularly hard hit in the Great Depression, experiencing some of the country's harshest labor strife in that era. Violence during the Maritime Strike of 1934 cost Seattle much of its maritime traffic, which was rerouted to the Port of Los Angeles. Still, Seattle remained the corporate headquarters of Boeing until 2001, when the company announced a desire to separate its headquarters from its major production facilities. Following a bidding war among a number of major cities, Boeing moved its corporate headquarters to Chicago. The Seattle area is still home to Boeing's Renton narrow-body plant (where the 707, 720, 727, and 757 were assembled, and the 737 is assembled today) and Everett wide-body plant (assembly plant for the 747, 767, 777 and the upcoming 787 Dreamliner), as well as BECU, formerly the Boeing Employees Credit Union. As prosperity began to return in the 1980s, the city was stunned by the Wah Mee Massacre in 1983, when thirteen people were killed in an illegal gambling club in the International District, Seattle's Chinatown. Beginning with Microsoft's 1979 move from Albuquerque, New Mexico to nearby Bellevue, Washington, Seattle and its suburbs became home to a number of technology companies including Amazon.com, RealNetworks, McCaw Cellular (now part of AT&T Mobility), VoiceStream (now T-Mobile USA), and biomedical corporations such as HeartStream (later purchased by Philips), Heart Technologies (later purchased by Boston Scientific), Physio-Control (later purchased by Medtronic), ZymoGenetics, ICOS (later purchased by Eli Lilly and Company) and Immunex (later purchased by Amgen). This success brought an influx of new citizens with a population increase within city limits of almost 50,000 between 1990 and 2000, and saw Seattle's real estate become some of the most expensive in the country. Many of the Seattle area's tech companies remain relatively strong, but the frenzied dot-com boom years ended in early 2001. Seattle in this period attracted widespread attention as home to these many companies, but also by hosting the 1990 Goodwill Games and the APEC leaders conference in 1993, as well as through the worldwide popularity of grunge rock, a sound that had developed in Seattle's independent music scene. Another bid for worldwide attention-hosting the WTO Ministerial Conference of 1999-garnered visibility, but not in the manner its sponsors desired, as related protest activity and police reactions to those protests overshadowed the conference itself. The city was further shaken by the Mardi Gras Riots in 2001 and was literally shaken the following day by the Nisqually Earthquake. Seattle's professional sports history began at the start of the 20th century with the PCHA's Seattle Metropolitans, which in 1917 became the first American hockey team to win the Stanley Cup. Today Seattle has three major professional sports teams: The National Football League's Seattle Seahawks, Major League Baseball's Seattle Mariners, and the 2004 Women's National Basketball Association champions, Seattle Storm. From 1967 to 2008 Seattle was home to an NBA franchise, the Seattle SuperSonics, who were the 1978-79 NBA champions; the team was relocated to Oklahoma City after the 2007-08 season. The Seattle Thunderbirds are a major-junior hockey team that plays in one of the Canadian major-junior hockey leagues, the WHL (Western Hockey League). The Thunderbirds currently play at KeyArena, but part way through the 2008-2009 season will move to nearby Kent, Washington. The Seattle Sounders currently play in the United Soccer League, but will be replaced by Seattle Sounders FC, which will play in Major League Soccer in 2009. Seattle also boasts a strong history in collegiate sports, the University of Washington and Seattle University are NCAA Division I schools. The Major League Baseball All-Star game was held in Seattle twice, first at the Kingdome in 1979 and again at Safeco Field in 2001. That same year, the Seattle Mariners set the all-time single regular season wins record with 116 wins. The NBA All-Star game was also held in Seattle twice, the first in 1974 at the Seattle Center Coliseum and the second in 1987 at the Kingdome. In 2006, the new Qwest Field (Seattle Seahawks Stadium) hosted the 2005-06 NFC Championship. In 2008, Qwest Field hosted the first game of the 2007-08 NFL playoffs, in which the Seahawks defeated the Washington Redskins, 35-14. Green Lake Park, popular among runners, contains a 2.9-mile (4.7 km) trail circling the lake. Seattle's mild, temperate marine climate allows year-round outdoor recreation, including walking, cycling, hiking, skiing, snowboarding, boating, team sports, and swimming. In town many people walk around Green Lake, through the forests and along the bluffs and beaches of 535-acre (2.2 km2) Discovery Park (the largest park in the city) in Magnolia, along the shores of Myrtle Edwards Park on the Downtown waterfront, or along Alki Beach in West Seattle. Also popular are hikes and skiing in the nearby Cascade or Olympic Mountains and kayaking and sailing in the waters of Puget Sound, the Strait of Juan de Fuca, and the Strait of Georgia. In 2005, Men's Fitness magazine named Seattle the fittest city in the United States. Six companies on the 2008 Fortune 500 list of the United States' largest companies, based on total revenue, are headquartered in Seattle: financial services company Washington Mutual (#97), Internet retailer Amazon.com (#171), coffee chain Starbucks (#277), department store Nordstrom (#299), insurance company Safeco Corporation (#388), and global logistics firm Expeditors International (#458). However, in April 2008, the sale of Safeco to Liberty Mutual was announced and in September 2008 Washington Mutual was seized by the FDIC and was sold to JPMorgan Chase. Other Fortune 500 companies popularly associated with Seattle are based in nearby Puget Sound cities. Warehouse club chain Costco Wholesale Corp. (#29), the largest company in Washington, is based in Issaquah. Microsoft (#44) and Nintendo of America are located in Redmond. Weyerhaeuser, the forest products company (#147), is based in Federal Way. Finally, Bellevue is home to truck manufacturer PACCAR (#169) and to international mobile telephony giant T-Mobile's U.S. subsidiary T-Mobile USA. Prior to moving its headquarters to Chicago, aerospace manufacturer Boeing (#27) was the largest company based in Seattle. Its largest division is still headquartered in nearby Renton, and the company has large aircraft manufacturing plants in Everett and Renton, so it remains the largest private employer in the Seattle metropolitan area. Seattle Mayor Greg Nickels announced a desire to spark a new economic boom driven by the biotechnology industry in 2006. Major redevelopment of the South Lake Union neighborhood is underway in an effort to attract new and established biotech companies to the city, joining biotech companies Corixa (acquired by GlaxoSmithKline), Immunex (now part of Amgen), and ZymoGenetics. Vulcan Inc., the holding company of billionaire Paul Allen, is behind most of the development projects in the region. While some see the new development as an economic boon, others have criticized Nickels and the Seattle City Council for pandering to Allen's interests at taxpayers' expense. Also in 2006, Expansion Magazine ranked Seattle among the top 10 metropolitan areas in the nation for climates favorable to business expansion. In 2005, Forbes ranked Seattle as the most expensive American city for buying a house based on the local income levels. According to the Washington State Office of Financial Management, Seattle had a population of 592,800 as of April 1, 2008. In the 2000 census interim measurements of 2006, there were 258,499 households and 113,400 families residing in the city. According to the 2005-2007 American Community Survey, the city's population was 74.1 percent White (67.9 percent non-Hispanic-White alone), 16.6 percent Asian, 10.0 percent Black or African American, 2.2 percent American Indian and Alaska Native, 0.8 percent Native Hawaiian and Other Pacific Islander, 3.1 percent from some other race and 4.2 percent from two or more races. 6.2 percent were Hispanic or Latino of any race. In the 2000 census, 11.3 percent of respondents claimed German descent, 9.1 percent claimed Irish descent, 8.1 percent claimed English descent and 5.0 percent claimed Norwegian descent. As their first language, 80.1 percent spoke English, 4.2 percent Spanish, 2.3 percent Chinese or Mandarin, 2.0 percent Tagalog and 1.9 percent Vietnamese. Seattle has seen a major increase in immigration in recent decades: the foreign-born population increased 40 percent between the 1990 and 2000 censuses. At nearly 4 percent, Greater Seattle has the highest concentration of mixed-race persons of any major metropolitan area in the United States. As of 1999, the median income of a city household was $45,736, and the median income for a family was $62,195. Males had a median income of $40,929 versus $35,134 for females. The per capita income for the city was $30,306 11.8 percent of the population and 6.9 percent of families are below the poverty line. Of people living in poverty, 13.8 percent are under the age of 18 and 10.2 percent are 65 or older. It is estimated that King County has 8,000 homeless on any given night, and many of those live in Seattle. In September 2005, King County adopted a 'Ten-Year Plan to End Homelessness', one of the near-term results of which is a shift of funding from homeless shelter beds to permanent housing. In 2006, after growing by 4,000 citizens per annum for the previous 16 years, regional planners expected the population of Seattle to grow by 200,000 people by 2040. However, Mayor Nickels supported plans that would increase the population by 60 percent, or 350,000 people, by 2040 and is working on ways to accommodate this growth while keeping Seattle's single-family housing zoning laws. The Seattle City Council later voted to relax height limits on buildings in the greater part of Downtown, partly with the aim of increasing residential density in the city center. A 2006 study by UCLA indicates that Seattle has one of the highest LGBT populations per capita. With 12.9 percent of citizens polled identifying as gay, lesbian, or bisexual, the city ranks second of all major US cities, behind San Francisco and slightly ahead of Atlanta. Greater Seattle also ranks second among major US metropolitan areas, with 6.5 percent being LGBT. According to the 2000 US census, revised 2004, Seattle has the fifth highest proportion of single-person households nationwide among cities of 100,000 or more residents, at 40.8 percent. Seattle is a charter city, with a Mayor-Council form of government. Since 1911, Seattle's nine city councillors have been elected at large, rather than by geographic subdivisions. The only other elected offices are the city attorney and Municipal Court judges. All offices are non-partisan. Seattle's politics are strongly leftist, although there is a small libertarian movement within the metro area. It is one of the most liberal cities in the United States, with approximately 80 percent voting Democrat; only two precincts in Seattle, one located in the Broadmoor community, and one encompassing neighboring Madison Park-had a majority of votes for Republican George W. Bush in the 2004 presidential election. In partisan elections for the Washington State Legislature and United States Congress, nearly all elections are won by Democrats. Seattle dominates Washington's 7th congressional district, home to Representative Jim McDermott, one of Congress' most liberal members. Of the city's population over the age of 25, 51.6 percent (vs. a national average of 24 percent) hold a bachelor's degree or higher, and 93 percent (vs. 80 percent nationally) have a high school diploma or equivalent. A United States Census Bureau survey showed that Seattle had the highest percentage of college and university graduates of any major U.S. city. The city was listed as the most literate of the country's sixty-nine largest cities in 2005 and 2006 and second most literate in 2007, and tied for most literate again in 2008 in a study conducted by Central Connecticut State University. Seattle is home to one of the United States' most respected public research universities, the University of Washington. A study by Newsweek International in 2006 cited UW as the twenty-second best university in the world. Seattle also has a number of smaller private universities including Seattle University and Seattle Pacific University, both founded by religious groups; universities aimed at the working adult, like City University and Antioch University; and a number of arts colleges, such as Cornish College of the Arts and The Art Institute of Seattle. In 2001, Time magazine selected Seattle Central Community College as best college of the year, stating the school 'pushes diverse students to work together in small teams'. The University of Washington is consistently ranked among the country's top leading institutions in medical research. Seattle has seen local developments of modern paramedic services with the establishment of Medic One in 1970. In 1974, a 60 Minutes story on the success of the then four-year-old Medic One paramedic system called Seattle 'the best place in the world to have a heart attack'. Three of Seattle's largest medical centers are located on First Hill. Harborview Medical Center, the public county hospital, is the only Level I trauma hospital serving Washington, Alaska, Montana, and Idaho. Virginia Mason Medical Center and Swedish Medical Center's two largest campuses are also located in this part of Seattle. This concentration of hospitals resulted in the neighborhood's nickname 'Pill Hill'. Located in the Laurelhurst neighborhood, Children's Hospital and Regional Medical Center is the pediatric referral center for Washington, Alaska, Montana, and Idaho. The Fred Hutchinson Cancer Research Center has a campus in the Eastlake neighborhood and also shares facilities with the Seattle Cancer Care Alliance and University of Washington Medical Center. The University District is home to the University of Washington Medical Center which, along with Harborview, is operated by the University of Washington. Seattle is also served by a Veterans Affairs hospital on Beacon Hill, a third campus of Swedish in Ballard, and Northwest Hospital and Medical Center near Northgate Mall. Even though Seattle is old enough that railways and streetcars once dominated its transportation system, automobiles are now the main mode of transportation. Seattle is also serviced by an extensive network of bus routes and two commuter rail routes connecting it to many of its suburbs. The first streetcars appeared in 1889 and were instrumental in the creation of a relatively well-defined downtown and strong neighborhoods at the end of their lines. The advent of the automobile sounded the death knell for rail in Seattle. Tacoma-Seattle railway service ended in 1929 and the Everett-Seattle service came to an end in 1939, replaced by inexpensive automobiles running on the recently developed highway system. Rails on city streets were paved over or removed, and the arrival of trolleybuses brought the end of streetcars in Seattle in 1941. This left an extensive network of privately owned buses (later public) as the only mass transit within the city and throughout the region. King County Metro buses are an important public transportation connection between Seattle and its suburbs. In 2005, seventeen percent of Seattle's workforce used one of the three public transit systems that service the city according to a study by the U.S. Census Bureau. King County Metro provides a frequent stop bus service within the city and surrounding county and a streetcar line between South Lake Union and Westlake Center, the South Lake Union Streetcar. Seattle is one of the few cities in North America whose bus fleet includes electric trolleybuses. Sound Transit currently operates an express bus service; the Sounder commuter rail service between the suburbs and downtown; and, beginning in the summer of 2009, the Central Link light rail line between downtown and Sea-Tac Airport, giving the city its first rapid transit line that has intermediate stops within the city limits. Washington State Ferries, which manages the largest network of ferries in the United States and third largest in the world, connects Seattle to Bainbridge and Vashon Islands in Puget Sound and to Bremerton and Southworth on the Kitsap Peninsula. Seattle-Tacoma International Airport, locally known as Sea-Tac Airport and located just south in the neighboring city of SeaTac, is operated by the Port of Seattle and provides commercial air service to destinations throughout the world. Closer to downtown, Boeing Field is used for general aviation, cargo flights, and testing/delivery of Boeing airliners. Seattle's streets are laid out in a cardinal directions grid pattern, except in the central business district where early city leaders Arthur Denny and Carson Boren insisted on orienting their plats relative to the shoreline rather than to true North. Only two roads, Interstate 5 and State Route 99 (both limited-access highways), run uninterrupted through the city from north to south. Water and electric power are municipal services, provided by Seattle Public Utilities and Seattle City Light respectively. Privately owned utility companies serving Seattle include Puget Sound Energy (natural gas); Seattle Steam Company (steam); Waste Management, Inc and Allied Waste (curbside recycling and solid waste removal); and Verizon, Qwest and Comcast (telephone, Internet, and cable television).